Books+Publishing magazine’s third issue for 2016 is out now! It features 38 reviews of adult and children’s books publishing in September to November. Melina Marchetta’s Tell the Truth, Shame the Devil (Viking, September) received a five-star rating from reviewer Fiona Hardy, who writes that Marchetta’s adult-fiction debut set against the backdrop of ‘Europe’s simmering anti-Muslim sentiments’ is an ‘electrifying contemporary detective thriller’. In a contest for second position, Holly Throsby’s Goodwood (A&U, October), Avan Judd Stallard’s Antipodes: In Search of the Southern Continent (Monash University Publishing, November) and Mark McKenna’s From the Edge: Australia’s Lost Histories (Miegunyah Press, October) each received 4.5 stars. This issue features an extensive preview of publishers’ upcoming Christmas offerings as Andrea Hanke, Jackie Tang and Brad Jefferies round-up the holiday highlights and must-have stocking fillers. Exploring the international scene, Readings events manager Christine Gordon reflects on her recent visits to bookstores in London and Paris, while Simon Collinson determines how local publishers are expanding overseas. Musician Holly Throsby speaks to Carody Culver about her debut novel Goodwood while Fiona Hardy interviews Melina Marchetta about her departure from YA fiction with Tell the Truth, Shame the Devil. Elsewhere in the issue, Nielsen Book Australia general manager Shaun Symonds looks at what makes a bestseller in Australia; book designer Evi Oetomo shares her career journey; and Terri-ann White breaks down marketing in the book industry. 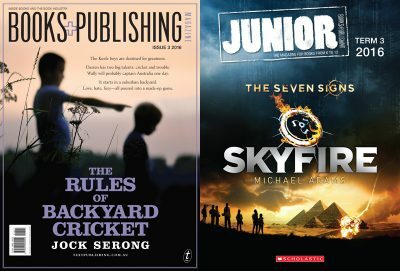 Two books scored 4.5 stars in this issue of Junior. Angela Crocombe describes Maxine Beneba Clarke and Van T Rudd’s The Patchwork Bike (Lothian, November) as a ‘delightful picture book’ that ultimately ‘asks more questions than it answers’. Cath Crowley’s YA novel Words in Deep Blue (Pan, September) ‘is filled with complicated and flawed characters’, writes reviewer Meg Whelan. It examines ‘grief, love and the power of words’ set against the ‘evocative background of a used bookstore’. Whelan also interviews the author here. This issue also contains Carody Culver’s exploration of how children’s literature tackles complex emotions; Joanne Shiells’ behind-the-scenes look at the ABA Kids’ Reading Guide; Deb Force, Romy Bradbeer and Kate O’Donnell’s Younger Sun bookseller’s diary; Angela Crocombe’s interview with Richard Roxburgh about his first children’s book Artie and the Grime Wave (A&U, October); and booksellers Anna Low, Deb Force and Kate O’Donnell wrap up their Christmas highlights for kids. Don’t miss all our regular features: retailing, editor’s picks, shelf talk, book bites, talkback and Gladys’ gossip column.